Just imagine spending a sunny day flying over the historical Maunalua bay on a Parasail ride, jetting across the water on high speed Jet skis, and exploring the bottom of the ocean with BOB, an underwater scooter. 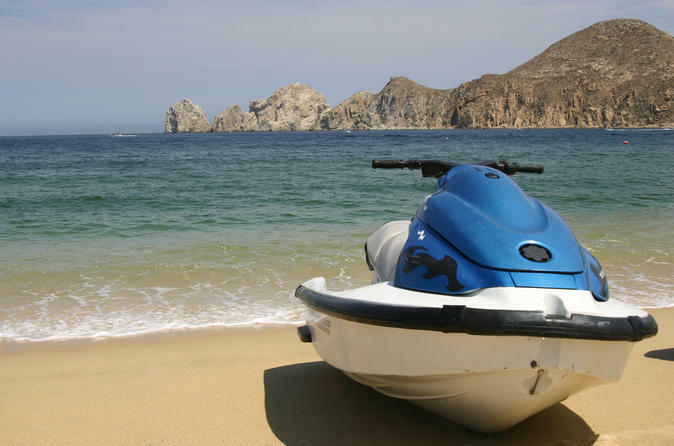 The three activity combo that consists of Parasail, Jet Ski, and BOB is the way to enjoy water sports at it's finest. The tour provides lunch at the world famous Teddy's bigger burgers and roundtrip transportation to and from Waikiki hotels with the peace of mind of knowing that you don’t have to search for parking or wait in traffic. The Hawaiian Seafari begins with parasailing over the beautiful and historical Maunalua Bay with the excellent and safe staff. From parasailing, the tour continues in the bay where the fast and thrilling Jet Ski rides begin. With a simple briefing, the barge captain will turn you into a pro rider in minutes. Following the jet ski ride, lunch will be provided by Hawaii’s most popular burger joint Teddy’s Bigger Burgers (Vegetarian Menu Available). Finish off the experience with BOB, an underwater scooter that lets you dive to the bottom of the ocean to get a close up view of Hawaii's marine life.The Hawaiian Seafari is a great way to splash into the blue waters and explore the island from a new perspective. The tour will eventually come to a close with transportation back to Waikiki where we say “Aloha A Hui Hou” or until we meet again!